Flow Meter (Gen 3) – What were you thinking?! I had to go with 4 of them, I cut out the 3/4" copper pipe and attempted to install the whole contraption with all 4 fittings connected to the flow meter and six inch length of 1" copper. Sounds like you’re attempting to complete this installation? Now I have an open gap in my copper pipe and I have no irrigation for the time being. This is a real problem in Arizona. What can I do? Photos of your installation would help us to better understand what you’re experiencing. There are some workaround we could do with unions if you don’t have any movement in your pipes. I had a similar problem in my installation (straight pipe and not enough play to insert components inline), and I eventually had to add four elbows and some additional pipe to create an alternate path to get the water flowing again. I still haven’t gotten back to installing the flow meter, but the irrigation system is working, I have water in the house, and I have a plan for picking it back up later. Orbit is a division of Hydro-Rain. I have sold the Hydro-Rain brand as well as a similar product from Lasco Fittings. With this model for an installation I might decide to buy a flow sensor after all. With this model for an installation I might decide to buy a flow sensor after all. This is where I am stuck. I cannot move either the top or bottom of my existing copper pipe to fit the flow meter + fittings, etc. into it. I dont know what to do now and I need to irrigate my plants. Couldn’t a union be used at the base? How? The pipe isnt threaded and I have a SharkBite 3/4" fitting at the bottom of the flow meter contraption. Then how about 2 unions, one at the top and one at the bottom of the assembly? Sweat the union at the top and the mating piece to the assembly, then sweat the bottom union to both the bottom of the assembly and the bottom copper. Slide the assembly in and tighten the nuts to both the unions. I guess in principle it would be possible to cut out more copper pipe and put unions in but then I have to sweat them onto the copper pipe. Im not a plumber and I havent developed those skills. And I really dont want to have to invest another $150 truck roll fee to bring one out in my area. I understand your pain but you said you need to water soon. It appears you have limited solutions and was trying to solve your delema and I thought mine might get you out of a jam. I didnt mean it to come across as not appreciated. 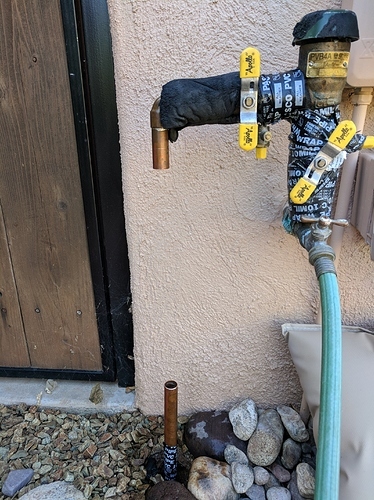 What i have done in the interim is that I have hooked some pex tubing into the ends of my flow meter and connected the pex temporarily to the copper pipe ends so that I can irrigate for the time being. this is obviously not a permanent solution because the flow meter is just dangling in the air next to the copper pipe. @nmstough – could you share a photo of your workaround? I’ll do some research for you tomorrow afternoon. Flow sensor installation on 3/4" copper—if you don’t mind sweating! For me to get enough play I had to find where the copper was joined with the 1’ sprinkler black PE tubing main feed to the valve box, and create some room in the ground. 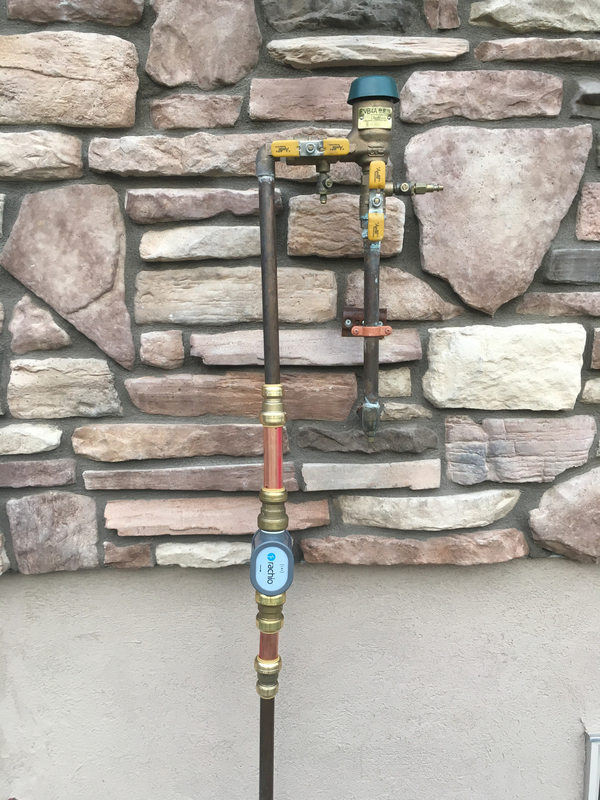 I will at some point replace the bottom 3/4 Copper and make it all 1’ after the Flow valve otherwise I have 3/4 Copper from Back Flow - 1’ Copper - Flow Valve - 1’ Copper - 3/4 Copper - 1’ PE then to valve box, so makes it a little neater so I can remove the 1’ - 3/4’reducer. I am actually amazed, but not surprised after reading all the Flow Installation posts how many residential setups are so different… all for a standard I suppose. Curios, have Rachio started mass distribution yet of the Flow Meter?